Our day in Santa Barbara started the same was as the previous day in Monterey- with a walk along the beach and a breakfast burrito. We could get used to this! One difference was that Santa Barbara is a lot warmer – even just having breakfast outside my Scottish skin felt like it was crisping up. After breakfast we hired beach cruiser bikes and cruised along the seafront, it was good to feel the breeze in our faces and allowed us to suss out the best part of the beach to spend our afternoon. 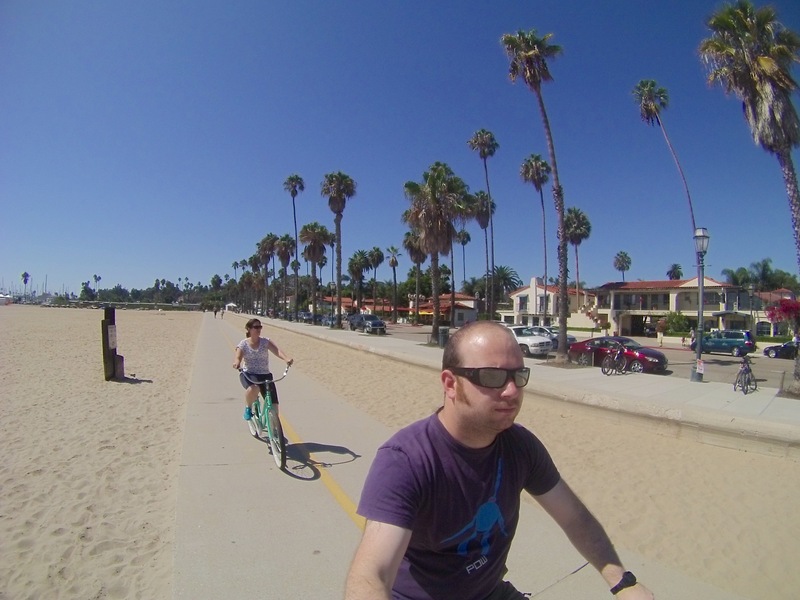 We rode 7.4km along the beach, with no elevation change, or mud – very strange for me! We chose the lagoon between Stearns Wharf and the harbour, watching the boats, SUPs and wildlife toing and froing in front of us, with a naval destroyer and oil wells on the horizon. I went for a swim and lazing in the cool water looking back at the mountains towering over the city was very relaxing. As it was so hot, we went for a walk along Stearns Wharf in search of ice cream, the wharf was less tacky than similar piers I’ve visited at Brighton and Llandudno in the UK and gave a great view of the city and mountains. We started our evening off with some wine tasting at the Santa Barbara Winery – 2 whites and 4 reds, all very nice but probably wasted on me – Jen liked them though, which is the important thing. We finished off with a walk up State Street, the main road in town and another seafood dinner – scallops for Jen and prawns for me. This entry was posted in Roadtrips and tagged California, Honeymoon, Photo by Lewis. Bookmark the permalink.